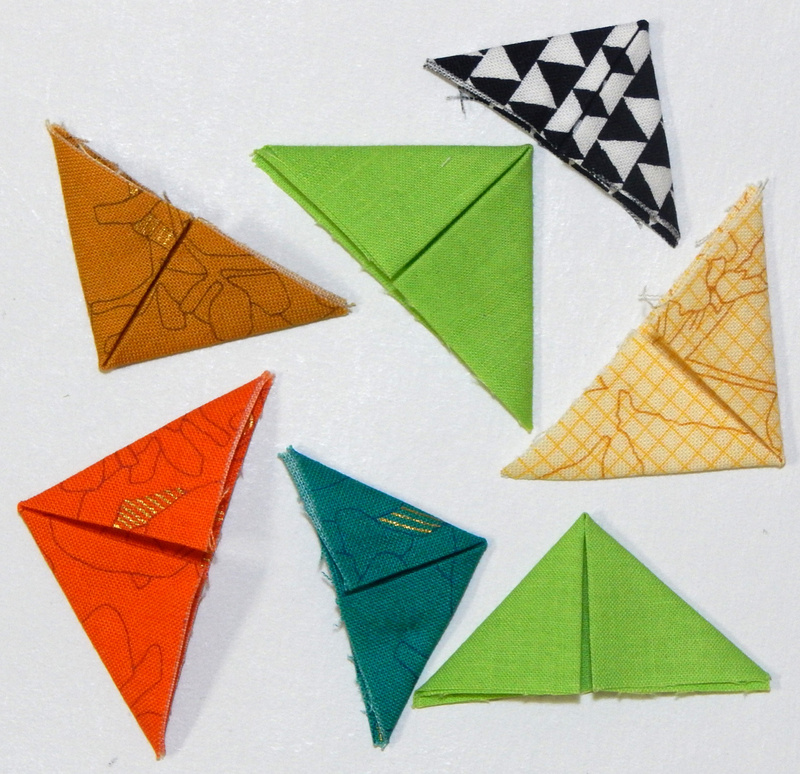 The November UFO project was to design a quilt to use these beautiful Jane Sassaman fabrics. Here’s my “final” decision on the layout. (“Final” in quotes because It isn’t over til it’s over). My notebook wasn’t big enough for the whole layout, but you get the idea! You can see paper mock-ups of my blocks showing the fabric HERE, but here are a couple of examples. 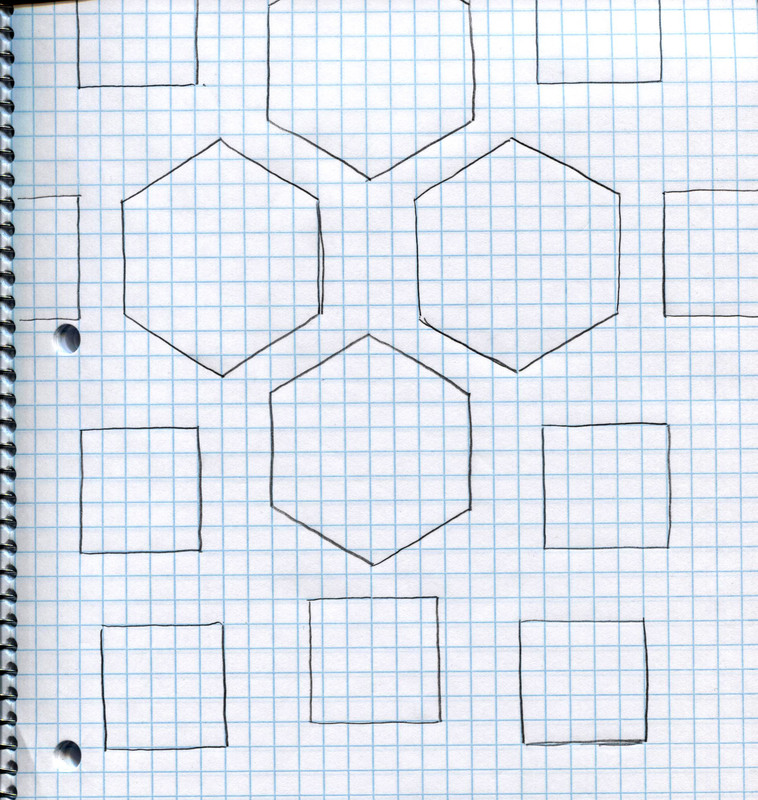 Of course, the one with 4 wedges would have 6 if this were the real blocks instead of a paper mock-up. I think I have enough fabric to make 4 central patches with 6 wedges each, though I’ll check before I cut (one of my husband’s favorites is, “measure twice, cut once”). Then I’ll fit in as many of the 4-patch kaleidoscopes as seems reasonable while leaving adequate negative space. I’m thinking I’ll use soft green fabric for the background; this seems to want to be a green quilt with pink and blue accents. The background probably will be a solid fabric, since these blocks have a lot going on. I’ve made two more projects this month, but they aren’t quilts. One is a crib sheet from this fun arrow fabric by Maureen Cracknell. The other is a changing pad cover in this “Indian Summer” fabric by Sarah Watson. There are several places on the internet to get free patterns for crib sheets and changing pad covers, and they were easy to make. And now, ON TO THE CHRISTMAS SEWING!!! As you probably know, I’m playing along with Aunt Marti’s UFO Challenge for 2015. 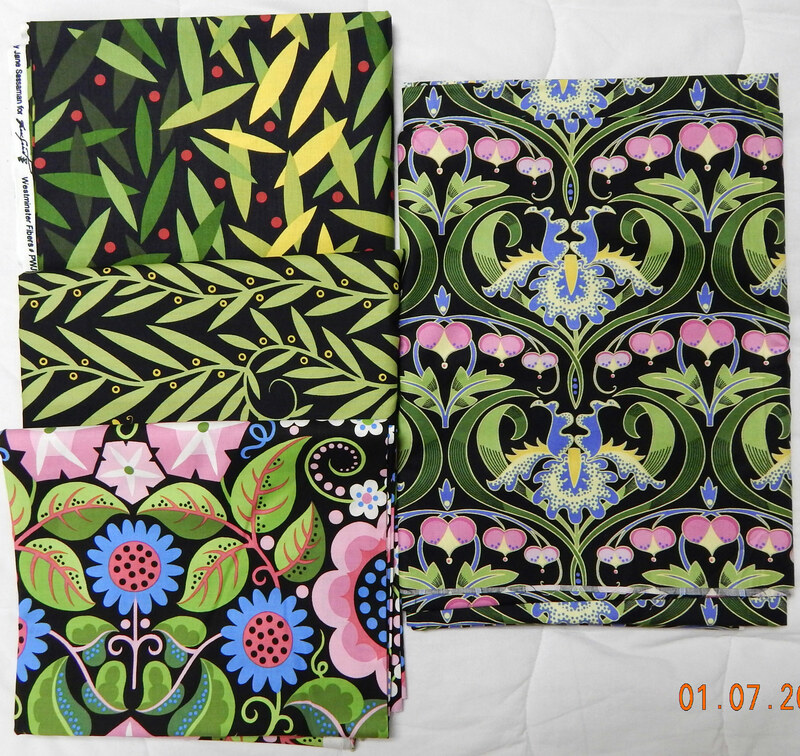 This month’s UFO is a group of gorgeous Jane Sassaman fabrics I’ve had for several years. I want to make a queen sized quilt, but I’ve been debating the design for a long time, since I want to make the most of these fabrics. 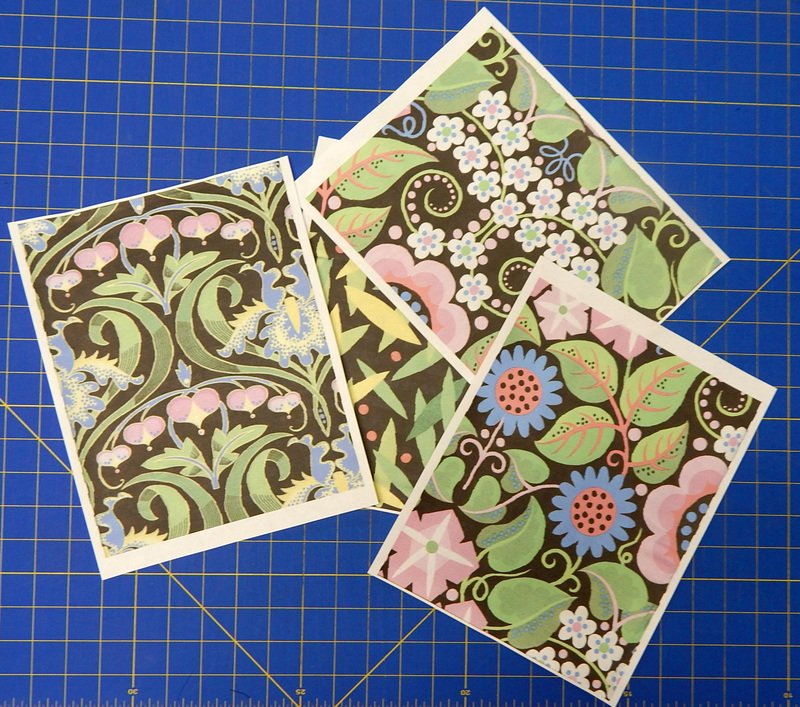 Luckily, a quilter who is a better designer than I came to visit this fall, and she helped me look at ways to make kaleidoscope blocks from these fabrics. So November’s challenge is to come up with a design for the quilt. I’m not even requiring myself to CUT any fabric, just decide on a design. 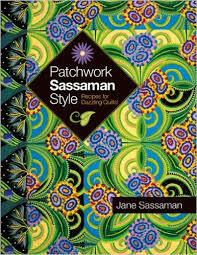 Jane Sassaman’s book suggests making paper copies of the fabrics to cut up in order to try designs. 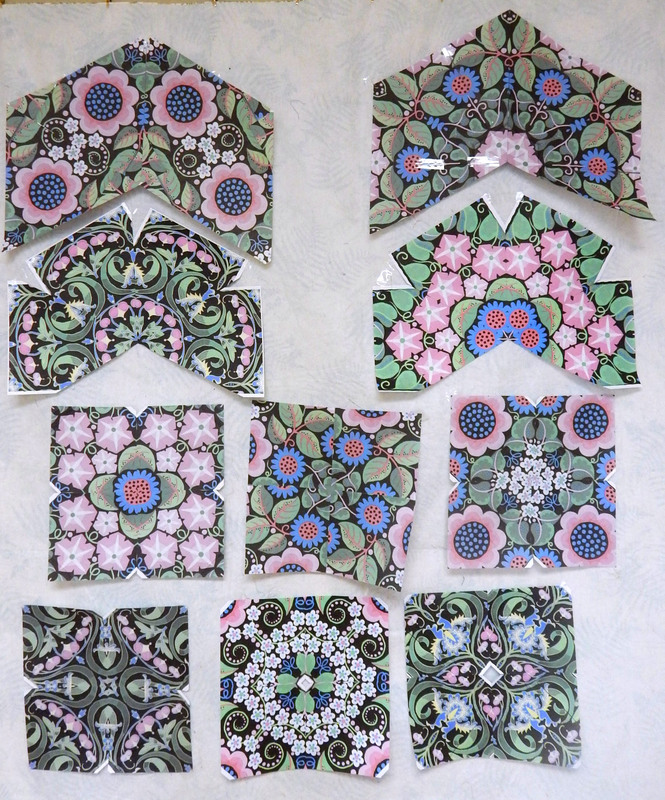 I scanned the fabrics to my printer and made many copies, then cut them up to make either 4-part or 6-part kaleidoscope blocks. Of course, that limits my trials to typing paper size pieces. Any suggestions for making the most of these prints, either with or without kaleidoscope blocks? I’ve been looking at lots of beautiful pictures of art quilts. 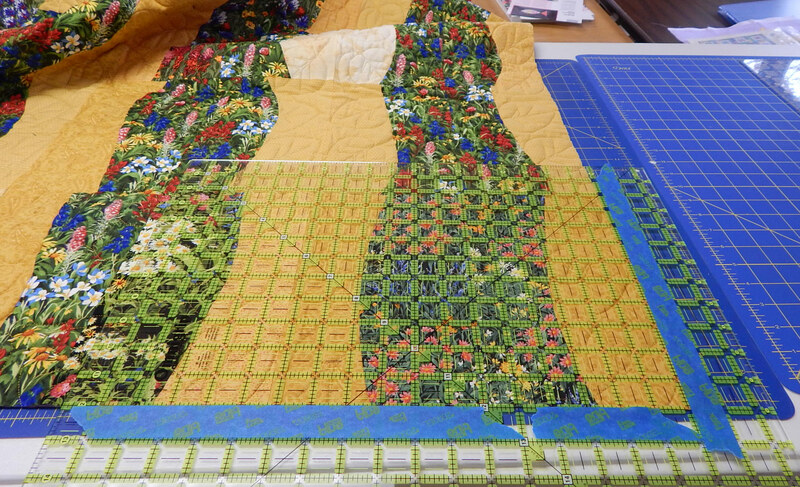 Also, the monthly challenge for the Modern Quilt Guild of Franklin (NC) was to make something including prairie points. For years I’ve had Susan K. Cleveland’s Prairie Pointer, intending to make something with prairie points “any day now”. (Raise your hand if you DON’T know how THAT goes!) The stars finally aligned, and here is my first crack at a table runner combining all of the above. As expected, Susan’s Prairie Pointer tool worked beautifully. I’m a big fan of her techniques, and teach some of them in my classes. 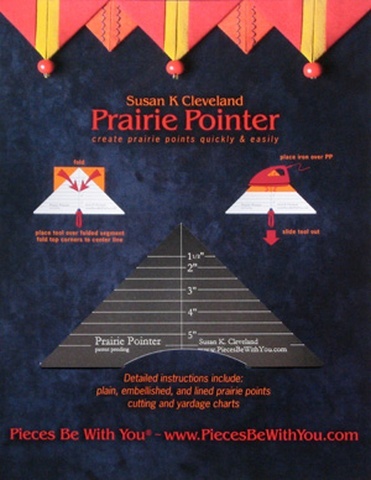 The starting squares for the prairie points ranged from 1-1/2″ to 2-1/2″ in size, so they were all pretty small. 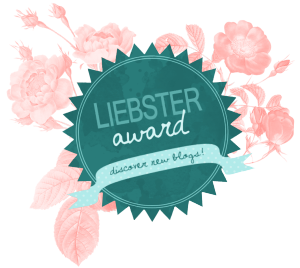 Turns out the Liebster award is a tag game for helping readers discover new and under-read blogs. Wanda over at Wanda’s Life Sampler tagged me. So thanks to Wanda, and I’ll be passing it on to some other bloggers. You can check them out at the end of this post. 1. What one thing do you believe with your whole being? It’s important to learn something new every day. It may be positive or negative, but all knowledge is useful eventually. 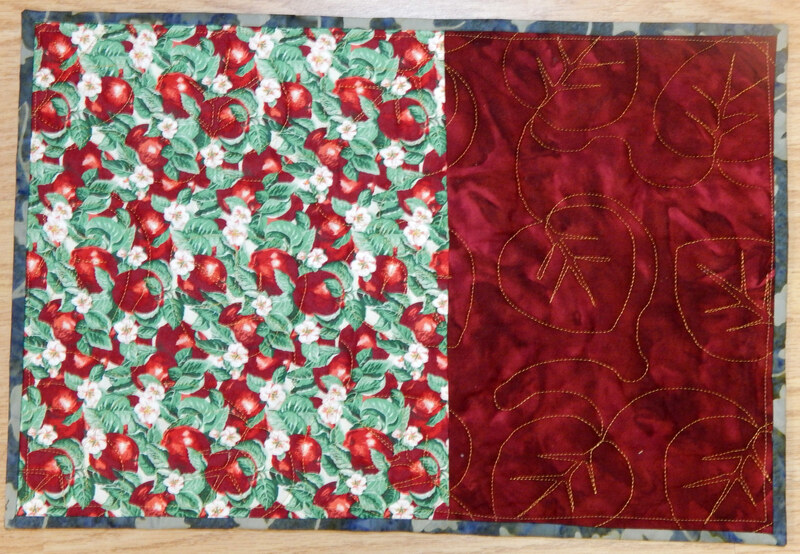 I learned to make a sample block before cutting out the whole quilt! 2. What have you made lately? I’m glad you asked that question! 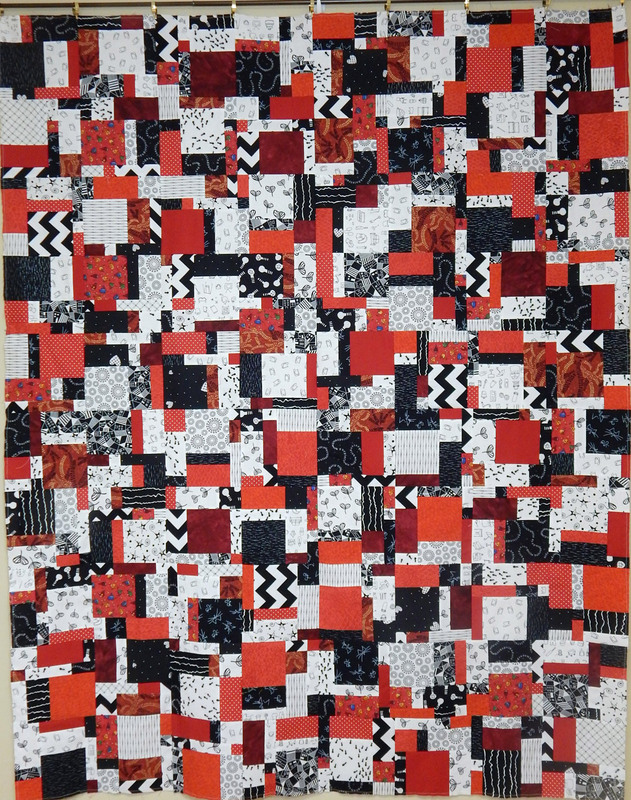 This month’s finish is the top for a “Black and White and Red All Over” quilt for which I’ve been collecting fabrics for some time. This was made from a pattern called “Lemon Pepper”, but of course mine is more red pepper! 4. Where do you hope to be in 10 years’ time? 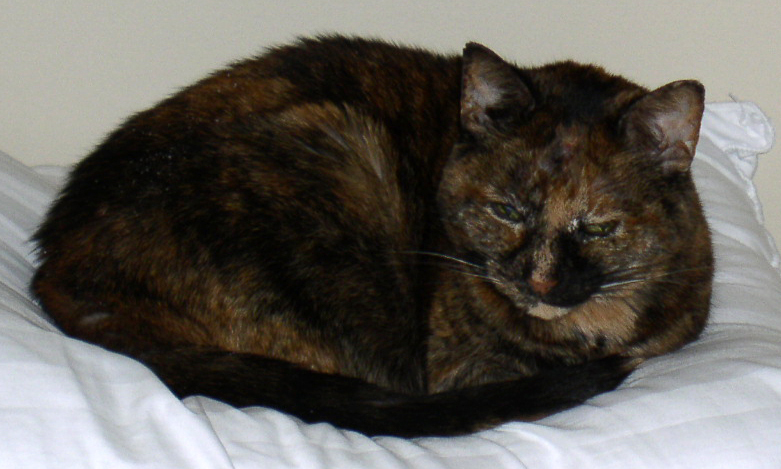 Retired from my “day job” and in my quilt studio full time! 6. What is one thing you wish you were better at? 7. Describe your Dream Vacation? The next one! But I did recently have a great trip with my husband to Clingman’s Dome in the Great Smoky Mountains National Park. To promote modern quilting, and North Carolina quilters in particular. If you’re a North Carolina quilter and I haven’t featured your work yet, please contact me! 9. 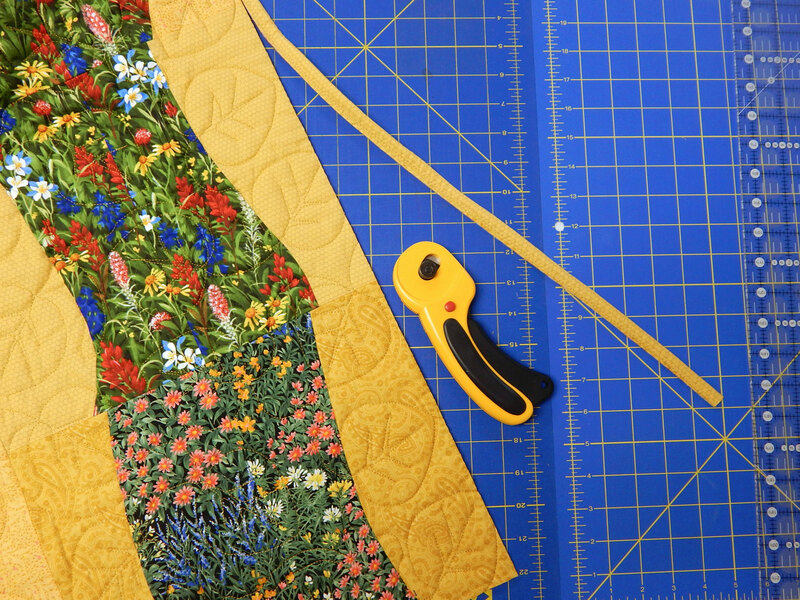 Your best sewing/quilting advice? Do what you enjoy. I used to make all my own clothes, but then I figured out it’s a lot easier to get a quilt to fit a bed than to get a garment to fit my frame! 10. What else is new? 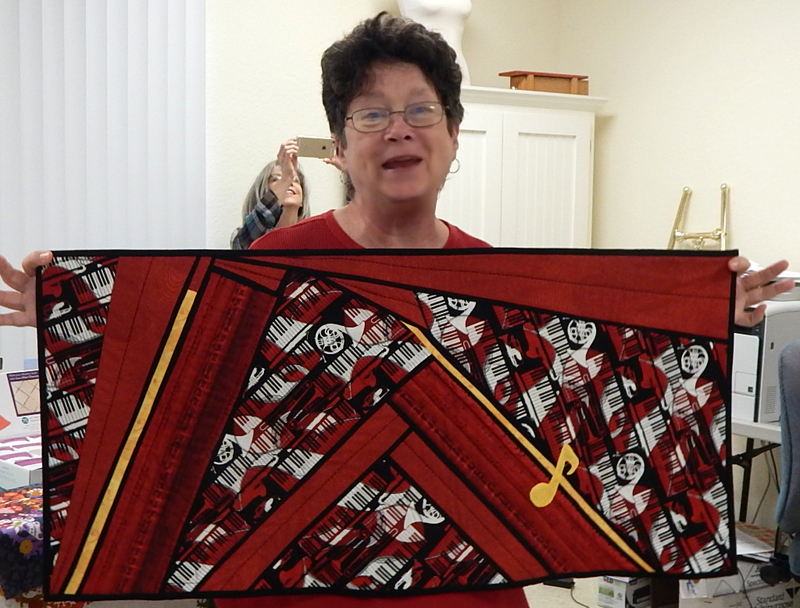 Here’s a picture of Pat with her FINISHED table runner, started in a class I taught recently! And here are some bloggers I’m passing the “Liebster Award” on to. I think you might enjoy them!